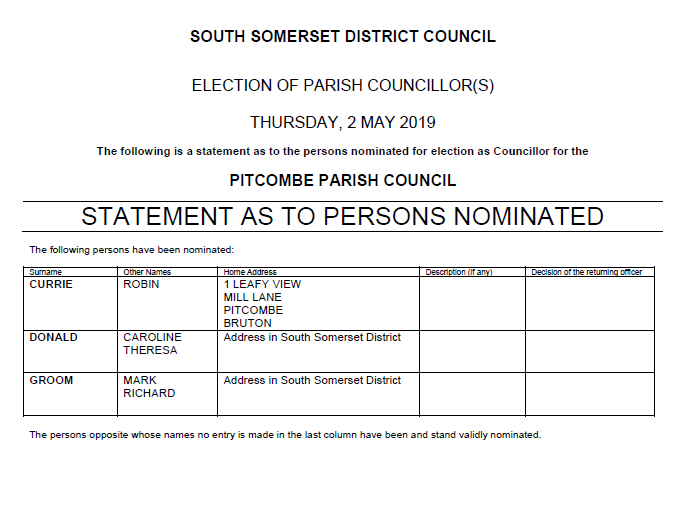 Pitcombe Parish Council is calling on residents, passionate about their community, to stand in the local elections in 2019. Pitcombe Parish Council is very small so councillors spend approximately four hours per month on Parish Council activities. This often includes attending meetings, engaging with residents and speaking on behalf of the council to other bodies. 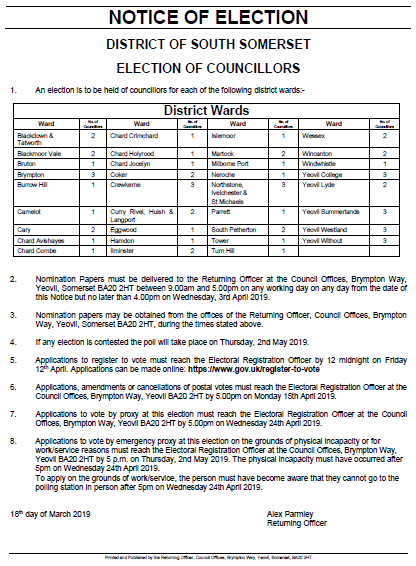 Some of our present Parish Councillors will not be standing at the elections on 2nd May, so there will be opportunities for you to get involved. 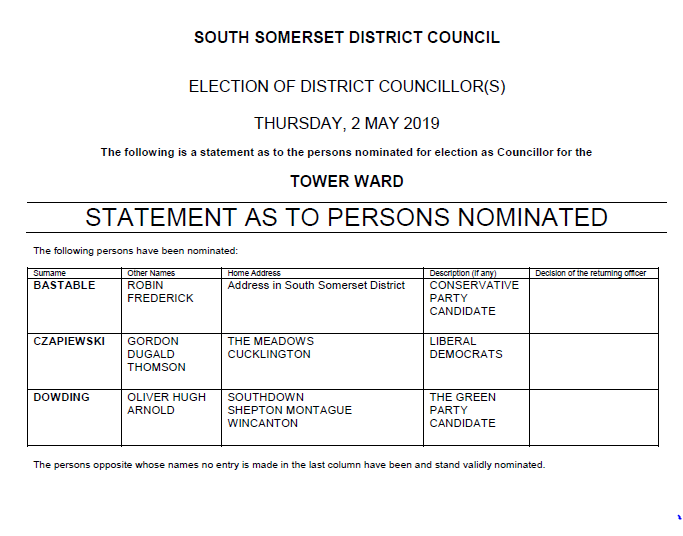 Nomination papers will be available from around 18th March and they must be submitted to South Somerset District Council by 3rd April. 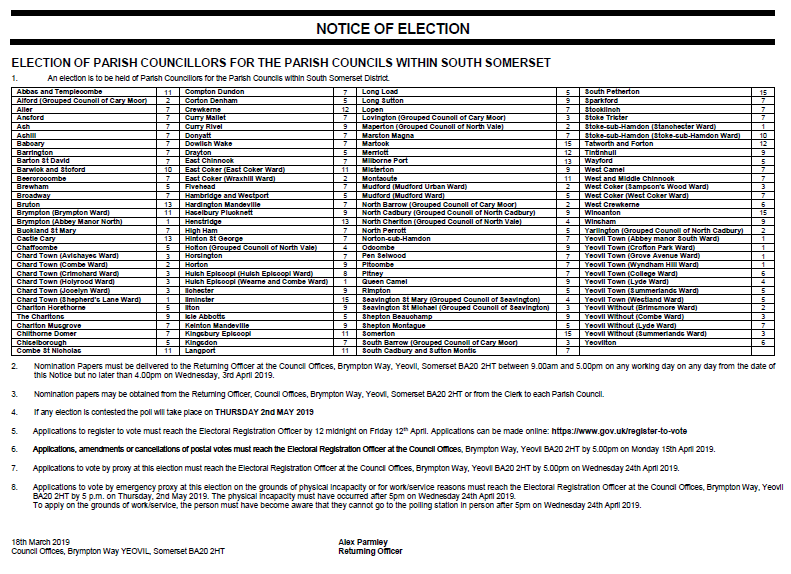 The Council seeks to appoint a Parish Clerk and Responsible Financial Officer (RFO). The appointment is for an average of 5 hours per week and the salary will be as per the national recommended salary scale commensurate with experience for part time Clerks (WEF 1st April 2019) SCP LC1 7 – 12. The Parish Clerk is responsible for organising all meetings of the Council, publishing agendas and minutes, dealing with correspondence, maintaining the Parish Council website, liaising with other organisations and overseeing certain projects. In addition, as RFO, the Clerk will be responsible for all aspects of financial administration of the Council. The Clerk works from home and must be computer literate. A laptop, scanner and other equipment are provided. The successful applicant ideally should be CiLCA qualified or be prepared to undertake training to obtain the qualification. Attendance at the evening meetings of the Council is a requirement of the position. Normal meetings take place on the second Tuesday of every month. For further details, a copy of the job description, person specification and application form please contact the Council at clerk@pitcombepc.org.uk. For an informal chat about the role please contact the current Clerk, Zöe Godden on the above email or by calling 07742 930521. The closing date for applications is Sunday 5th May 2019 and interviews are planned for Wednesday 8th May 2019. To apply please send the application form to the above email address. Click on the Co-option notice above to find out how to apply.